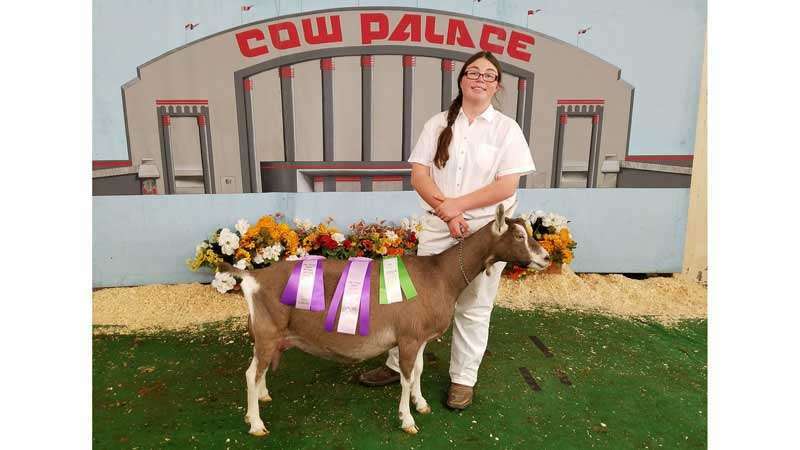 Kristin Roberti of Sierra Valley garnered several top awards at the 2017 Grand National Livestock Exposition at the Cow Palace in San Francisco on Oct. 13 and 14. Roberti showed her herd of eight registered Toggenburg dairy goats in the All Other Breeds Division. The awards included Best Udder Champion, Reserve Senior Champion, Reserve Grand Champion, Junior Champion and Reserve Junior Champion. Roberti also won six firsts, seven seconds, a third and placed fourth in the Intermediate Dairy Goat Showmanship competition. Another highlight of the Cow Palace show for Roberti was when she and fellow 4-H sheep exhibitor Case Emsoff of Chilcoot carried the American Flag with other 4-H, FFA and open exhibitors for the Grand National Rodeo Saturday evening performance. It was an honor and privilege to carry the American Flag and be in the arena when they honored firemen, policeman and servicemen and women, said Roberti. Roberti, daughter of Dave and Jane Roberti, is 14 years old and is a freshman at Loyalton High School. She is in her sixth year of the Sierra Valley 4-H Club where her projects include dairy goats, beef and Teen Leadership.